Akt, also known as Protein Kinase B (PKB), represents a family of serine/threonine protein kinases, Akt1, Akt2 and Akt3. Akt1 (v-Akt) was originally discovered as a proto-oncogene and plays a critical role in regulating diverse cellular functions, which include metabolism, growth, proliferation, survival, transcription, and protein synthesis. Akt is activated by various extracellular and intracellular signals, most involving the lipid kinase phosphoinositide 3-kinase (PI3K). It is also a major regulator of cell survival by inhibiting the apoptotic effects of signaling pathways and proteins (like FoxO1). Mitogen activated protein kinases (MAPKs) are the central component in numerous signaling cascades that transmit growth, proliferation, and survival signals from the cell surface to the nucleus. Stimulation of receptor-tyrosine kinases (RTKs) by growth factors, engagement of integrins, or changes in cellular homeostasis (stress, etc.) promote the activation of signaling pathways involving Erk (extracellular regulated kinase), p38 MAPK, or Jnk (c-Jun N-terminal kinase). Each of these kinases, in turn, promotes activation of transcription factors such as c-Jun, Ets, Alk, and ATF resulting in cellular growth, survival, repair, and proliferation. mTOR (mammalian target of rapamycin) is a protein kinase that functions as an ATP and amino acid sensor to balance nutrient and energy availability with cellular growth. mTOR can also be activated or inhibited by other signaling pathways involving Akt, Erk, and AMPK. mTOR in turn regulates a series of metabolic enzymes and other protein kinases that modulate lipid metabolism and biogenesis cellular growth and proliferation, and autophagy. The Hallmarks of Cancer are seminal manuscripts by Doctors Robert Weinberg and Douglas Hanahan and were published in Cell1. The authors proposed the idea that the complexity of cancer can be broken down into smaller subsets of underlying principles. The information here pertains to one Hallmark of Cancer, known as "Sustaining Proliferative Signaling." Other entries in this series explore the other proposed Hallmarks. Hanahan D, Weinberg RA (March 2011). 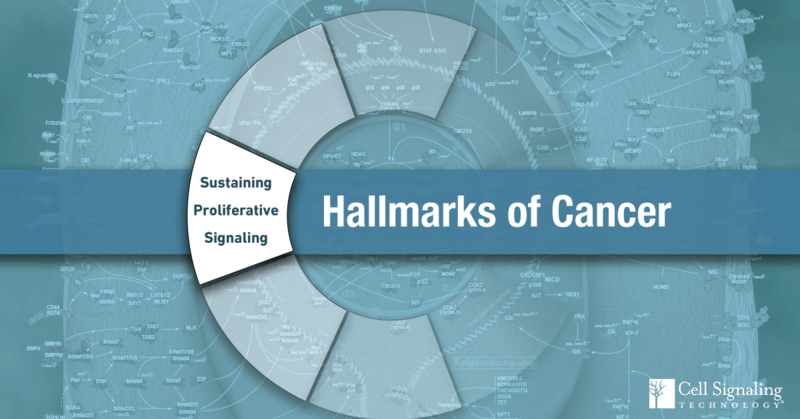 "Hallmarks of Cancer: the next generation". Cell. 144 (5):646-74. doi: 10.1016/j.cell.2011.02.013.